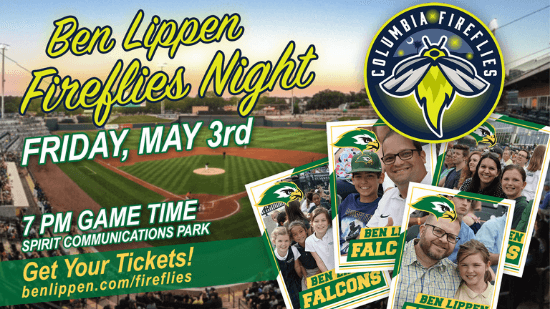 Friday, May 3, at 7 p.m.
All Ben Lippen families and alumni are invited to join us for a fantastic evening at a Fireflies baseball game. The lower school choir will sing the national anthem before the first pitch. Make sure to stay for the fireworks display after the game! Lower school students participating in the reading program will receive a free ticket and a meal voucher. Contact Patty Swift at Patty.Swift@BenLippen.com for details. Additional tickets for current families can be purchased below for $9 per ticket. Current families purchasing tickets will be seated in the stadium seating along the first base line in the same location as the lower school students receiving free tickets. Alumni purchasing tickets will be seated in the Palmetto Pavilion located down the first base line. A spacious, terraced picnic area will provide you with the opportunity to mix and mingle. Cost for alumni is $5 per ticket and includes a ticket to the game and an All-You-Can-Eat buffet featuring hot dogs, hamburgers, grilled chicken, pulled pork, mac & cheese, baked beans, pasta salad, peach crisp dessert, and Pepsi products. The buffet will begin at 6 p.m. (one hour before first pitch) and run until 7:30 p.m.
Each ticket purchased will come with a free Fireflies hat for an unforgettable experience! Contact Margaret Chase at Margaret.Chase@benlippen.com with any questions.